Springs are the parts of your garage door system that are in charge of supporting the weight of the panels. They need to be in an excellent condition because if they break, they can seriously injure somebody, not to mention cause your door to collapse. 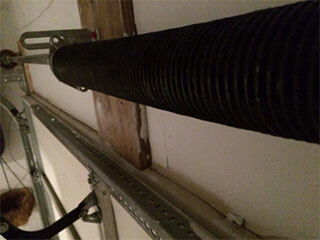 Most modern residential garage doors use one or two torsion springs, depending on their weight. There are a couple of different types of these components, each with its own benefits. The galvanized springs are the most widely used ones. They are made from a steel wire that has been specially coated with zinc, and this coating provides it with protection from rust and corrosion. This type of component requires regular lubrication maintenance in order to remain efficient and smooth. These components are made from steel wires that have been dipped in hot oil. This oil helps to reduce the friction between their coils but can leave a thin layer of residue on the door over time. This type of springs is preferred for heavier doors which are used a lot of times during the day. The lift is the most important factor for selecting a spring. It shows how much force it can store and apply for the lifting of the door. The choice of lift depends on the size and weight of the unit. Keep in mind that there are three measures determining this factor. These include the length of the spring, its inside diameter and its wire size. You must check the estimated useful life of the part as well, as it can tell how long it will last. Contact our experts at Garage Door Repair Encino for more information and advice.